The pink one is mine born 1954, the white one is my mom's, Jill Mayne born 1935 and the blue one belonged to my grandmother, Elaine Coffman. Do you have a baby book? How about your parents or grandparents? 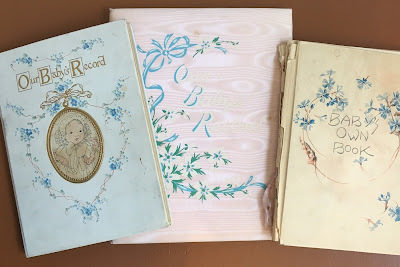 I am fortunate to have in my possession, three generations of baby books. The oldest one belonged to my grandmother, Elaine Blanche Coffman, 1910-2010. This book is over 100 years old and is a treasure. My grandmother was born in New York City on August 29, 1910. Here are a few of the images from the 1910 book. List of gifts received for Elaine Coffman in August and September of 1910 in New York City. I guess you could call the people on this list of gifts, my grandmother's "FAN" club. Genealogists use the acronym FAN for family/friends, associates and neighbors. I recognize a few of the names in the "FAN" club. The list was written by Elaine's mother, Mae Blanche Moss 1882-1963. Elaine's father was Ernest Ellsworth Coffman 1879-1934. Ernest and Mae were married in Oakland, California in 1907 and they moved to New York in 1908. My great-grandmother and my grandmother have similar handwriting. Aunt Grace would be Grace May King 1885-1968, the wife of Otis Coffman. Otis was Ernest's brother. "Grand Ma Coffman" is Harriet Ketcham, wife of Archibald Coffman. Viola N. Hughes is Ernest's sister and aunt of Elaine. The friends bear further scrutiny. No surname is given for Paul and Helen so they are difficult to trace. George Larkin and Miss J. McAllister are perhaps a couple. There are several men named George Larkin in the 1910 census so it is hard to determine which one would match. Thomas W. Gleason gave a pair of pink booties. There was a Thomas W. Gleason, age 34 who would have been about the same age as my great grandfather, Ernest Coffman in the 1910 census of Manhattan.. Mr. Gleason immigrated from Ireland in 1886. He was living at 325 Spring Street in Ward 8 of Manhattan at the time of my grandmother's birth. He was a supervisor of stevedores on the New York dock based on the 1910 and 1920 census records. The 1910 census shows eighteen families residing at 108 West 138th Street, Manhattan where Ernest, Mae and Harriet Coffman are residing on 16 April 1910. Grandma Mae wrote 110 West 138 Street, New York as the place of birth for Elaine. It is possible that the census taker neglected to write the the address when he arrived at that address so some of those eighteen families were probably at 110. When the census was taken in April 1910, Mae was pregnant and Harriet, Ernest's mother, was presumably there to help with the housekeeping when the baby came. The building number was cut off in the photograph below but it does not appear to be 108 or 110. My guess would be 141. None of the residents on West 138th appear to be on the list of gift givers. In the 1911-12 New York City Directory, Ernest E. Coffman had an office address of 17 E 125th. That building number also does not seem to be a match with this photograph. But I must say that it is an interesting looking building wherever it is. And that hat that Grandma Mae is wearing is quite distinctive. Mae Moss Coffman about 1910 in New York City with daughter, Elaine in baby carriage. There is a little dog at her feet which does not appear to be on a leash. Elaine's first outing appears to have been September 13, 1910. Then on December 4, 1910, "Elaine had her first ride in the subway and street cars to Brooklyn and enjoyed her outing very much." Perhaps the photograph was taken in Brooklyn. She was three months and five days old on December 4, 1910. Would Grandma Mae have taken the baby carriage on the subway and street cars? Then on Wednesday, December 7, 1910, "Elaine had her first ride in the snow down to 125th Street." Perhaps that ride in the snow was to visit daddy at his office at 17 West 125th Street. Ernest Coffman was working as a manager for the Gas Governor Company. "125th Street is a two-way street that runs east–west in the New York City borough of Manhattan, from First Avenue on the east to Marginal Street, ... along the Hudson River in the west. 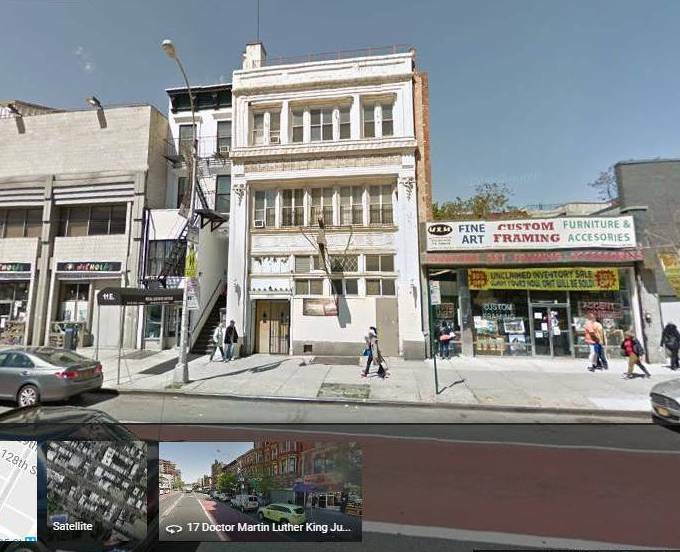 It is often considered to be the "Main Street" of Harlem, and is co-named Martin Luther King, Jr. Boulevard. Notable buildings along 125th Street include the Apollo Theater, the Adam Clayton Powell Jr. State Office Building, the Hotel Theresa, the Studio Museum in Harlem, the Mount Morris Bank Building, the Harlem Children's Zone, the Church of St. Joseph of the Holy Family, and the former West End Theatre, now home to the La Gree Baptist Church." These pictures from Elaine's baby book probably show the house where the Coffmans resided in Edgewater, New Jersey. Elaine is being held by her father, Ernest Coffman. The little dog is in the previous picture too. The New York City Directory of 1913 shows Ernest Coffman residing in Edgewater, New Jersey but the address is not given. Elaine's sister, Vivian was born in Edgewater on January 24, 1916. There used to be a ferry that ran across the Hudson River from Edgewater to the foot of West 125th Street. 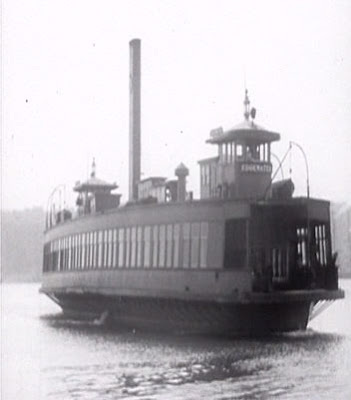 Wikipedia has the following image of the ferry which has Edgewater inscribed on it. Edgewater-125th Street ferryboat that crossed the Hudson River. SOURCE: Wikipedia. The playmate, Ward Gleason, may have been the son of Thomas W. Gleason on the list of gifts. First words "Da Da" were spoken on the first of March 1911. This looks like a Fourth of July picture with Elaine Coffman on the pony. This baby book is now over one hundred years old. Future blog posts will cover the next two generations.